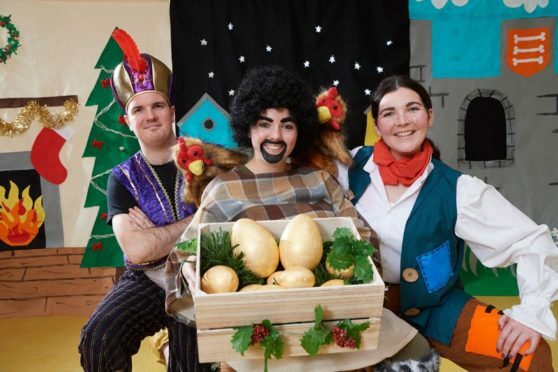 It’s behind you…the first date on a national tour of a Gaelic pantomime has taken place at Acharacle Primary School, with 39 more Gaelic medium schools to see the comedy before a city show later this month. A fifteen-day national tour of a Gaelic pantomime Seocan agus am Bogsa-ciùil, Seocan and the Accordion, will end with a public performance on Thursday December 13 at The Ironworks, Inverness. Angus Macleod, drama officer with Fèisean nan Gàidheal, who have put on the pantomime for the last 11 years, said: “The story follows the adventure of young Seocan, who in his efforts to earn some money for Christmas, encounters a helpful Highland genie called Fergie and the legendary but not-so-giant giant Murdanaidh Mòr.